Earlier this month one of our Associate Designers, Annie Liddle, traveled to the chic, cosmopolitan city of Milan, Italy. She was joined by a group of accomplished architects and designers from all over the country to experience the International Lifestyle Trade Fair, hosted by HOMI MILANO. 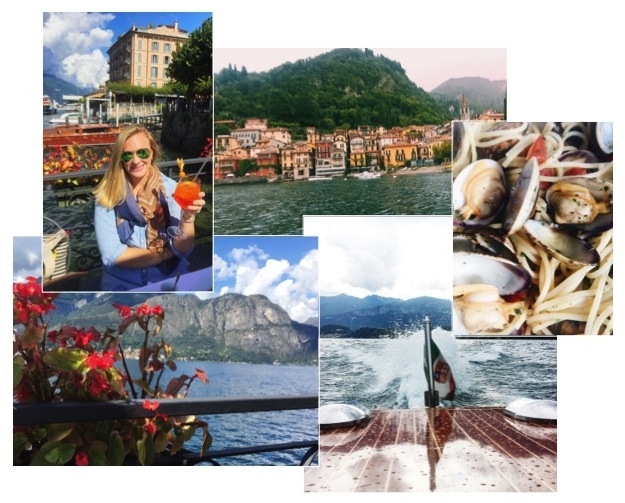 Travel along the Italian passageways and charming villages of Lake Como with us as she shares snippets from her amazing trip! All photos via Annie Liddle. My time at HOMI MILANO was spent touring exquisite exhibitions of Italian merchants. I gathered so much inspiration from the innovative artists and tradesmen who are currently paving the way for the latest trends in Interior Design. My favorite moment at HOMI MILANO was seeing a tile we selected for a client’s Master Bathroom chosen as a featured product. It’s the best feeling knowing you were ahead of the trend and that your design selections were spot-on, staying current and fresh even months after the install took place! (Photo below). Our client's Master Bathroom on the left, and the tile we selected featured at Homi on the right! One of my favorite designers of the trip was ALCHYMIA -- As quoted from their website, their purpose is found in "the excellence of decoration for ancient and evocative gestures, for innovation of styles, techniques and materials, for exclusive and tailor-made stories or nonconformists signs of domestic art." And they excel at creating just that. It was breathtaking to see the intricate details of their artwork in person, and I hope to find the perfect client for a commissioned piece soon! A special thank you the Italian American Chamber of Commerce for sponsoring this amazing cultural excursion, and to Jeannie for nominating me to represent Jeannie Balsam Interiors on this inspiring international design experience. Travel | Costa Rica - "Pura Vida"
Doug, the girls and I were fortunate to get away together for Spring Break! We headed to the Papagayo Penninsula and hung out with the Howler Monkeys. The people, climate and activities were exceptional! We stayed at the Hyatt Andaz and had daily excursions with zip-lining, rain forest hikes, mud baths, hot springs and horse back riding. Put this destination at the top of your "Get-A-Way List" and feel free to email for more details. Where's Waldo? Where in the world is Matt Lauer? Where did the Balsam Family end up this summer???? If you guessed Ireland & Portugal you win the BIG prize! We got back to my Irish roots and traveled with my sister's family to Ireland. I have say it's one of the most STUNNING natural environments I have ever experienced. If you ever end up in County Kerry, you MUST visit Gleninchaquin Park. It has lots of trails, a massive natural waterfall, and a sheep and lamb farm. They even let the kids feed them with baby bottles.... SO cute! In Portugal, we loved the food, Lisbon and the ECO RESORT: Areias do Seixo, but the cultural highlight that blew me away (and the entire family) was the Pena Palace in Sintra, Portugal. Built in the 19th century, the architecture and interior design reminded me that everything that is old is new again. I took tons of pictures and we are even referencing one photo to replicate a fainting chaise for a client project in Winnetka. Speaking of Texas, I wanted to share one of our favorite ways to spend a day in Austin. Head to the SOCO (South Of Congress) neighborhood - stay at the ultra low key San Jose Hotel, or its more posh sister property around the corner - Santa Cecilia. Wake up to breakfast @ JO's and hit the street for eclectic shopping. I always visit Uncommon Objects (the best vintage resources for jewelry, quirky home accessories, etc. ), then onto Yard Dog for alternative art, and Allen's for authentic cowboy boots. Once I'm ready for lunch, I'll either seek out one of the food trucks or grab a Tuna Burger at Hopdaddy Burger Bar-- which Doug swears is the best in the U.S.A., and that's quite a testimonial! I also recommend taking a walk around the river and if you're there at night head out on an excursion to watch the BATS under the bridge. Dinner on the patio at Perla is a definite favorite, especially during our winter months-- The combination of delicious seafood and oyster shooters in the most laid back atmosphere is DIVINE! After dinner, you can hop across the street to The Continental Club for live music that never disappoints. Have you been? What did you enjoy the most?